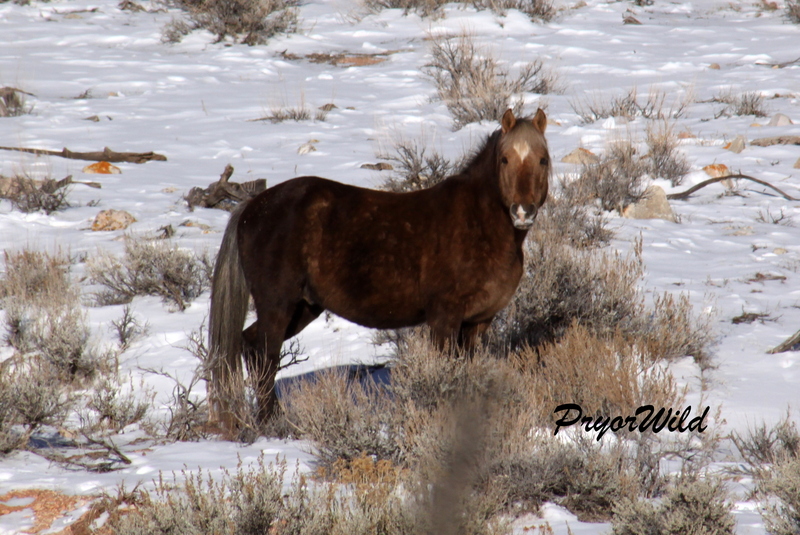 Looking for wild horses is far different in the winter than in the summer. 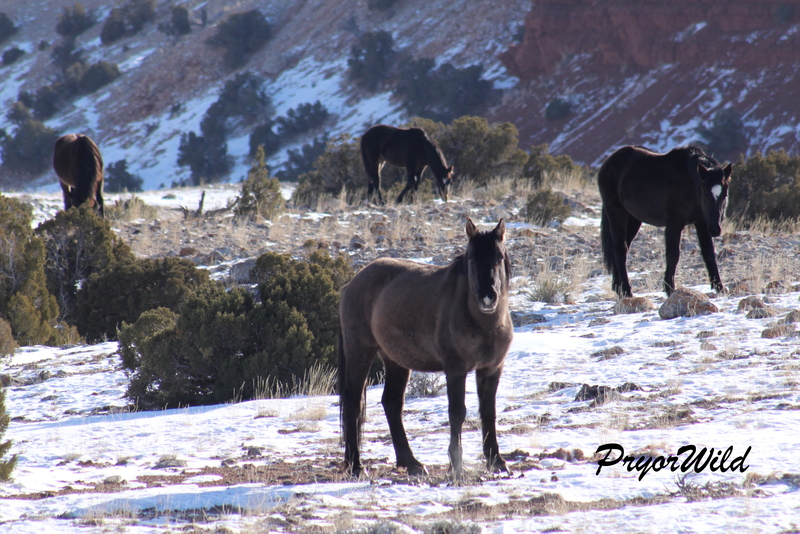 In the summer, it is possible to see most every horse by visiting the top of the Pryors and the Dryhead area. But in the winter, the horses are scarce. 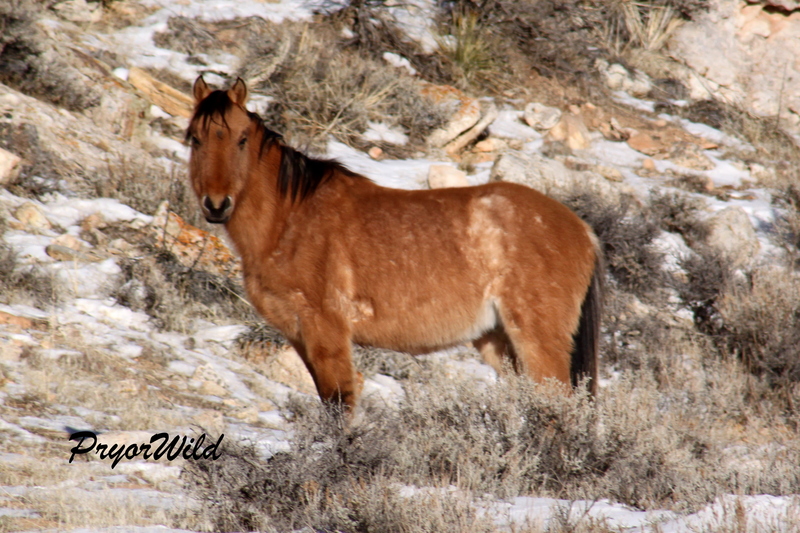 They scatter out across the mid- and lower elevations of the horse range to find suitable food and shelter in the harsh days of winter. This winter the area has been hit hard with some bitter cold weather. 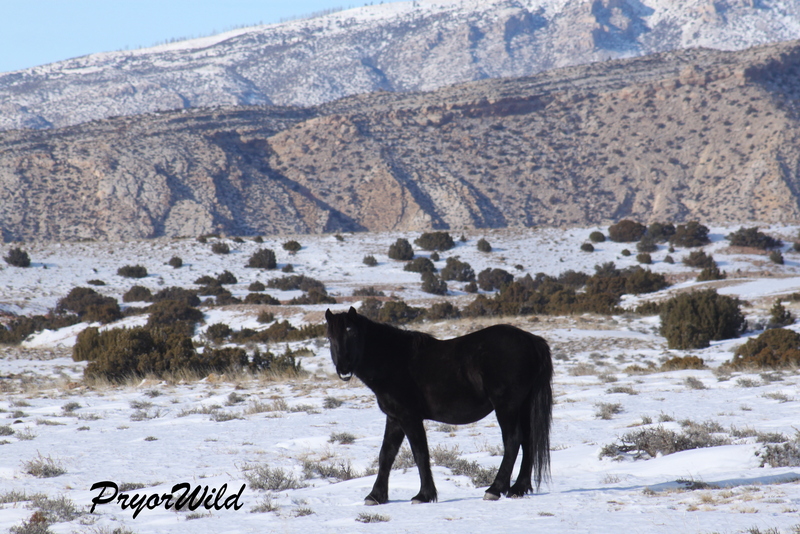 I (Nancy) took advantage of a blue sky day to head out onto Turkey Flats, an area frequently used by the wild horses in winter. Winter brings change and change has happened. My goal, through the blog, is simply to report what is seen. Winter’s changes are an example of natural management, and sometimes there are unanswered questions as a result. 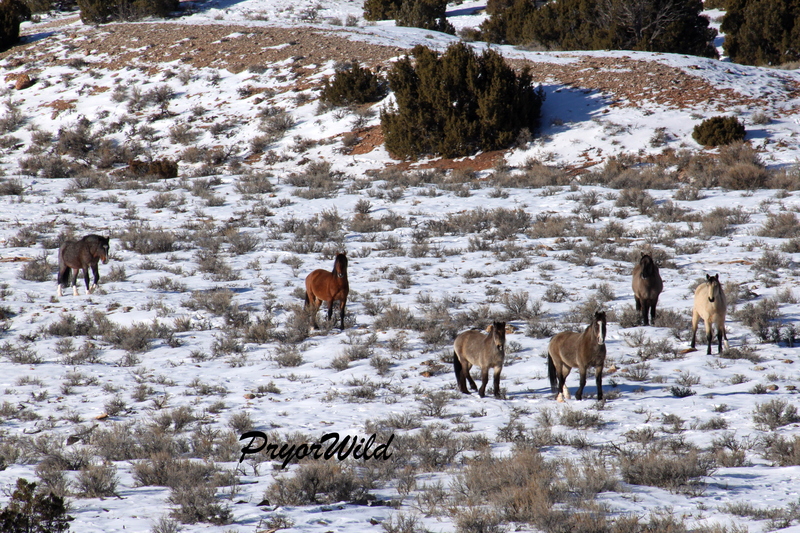 We will keep an eye on the range and provide updates as we continue to venture out on the Range throughout the winter. Near the red hills, it was a dun and a grullo, possibly Sitting Bull and Bristol. The grullo was sleeping in the warm, winter sun and the pair was left undisturbed. The picture also shows the amount of snow in the area. 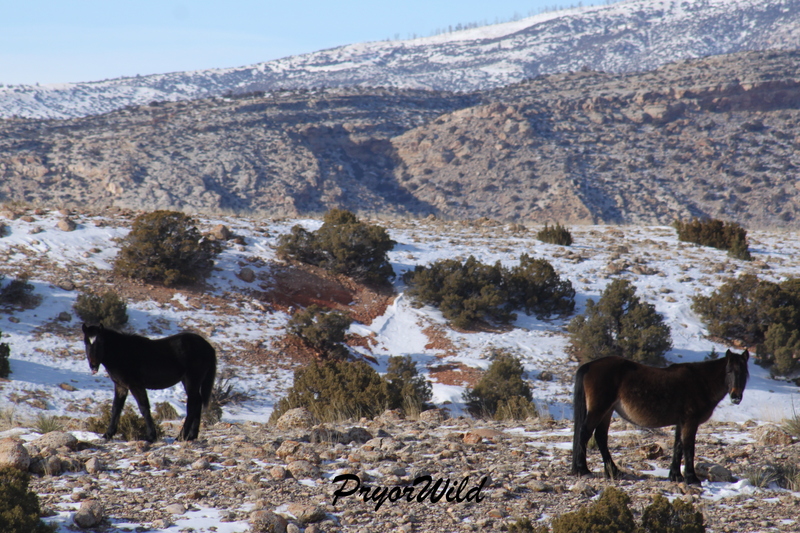 Look closely to find two horses…one on the left, the other is laying down on the right side of the photo. The last time I had seen Sitting Bull he was with his son, Inniq. Today Inniq was by himself farther out on the Flats. Just beyond Inniq was a band of horses. It was Garcia’s band. They caught sight of the “intruder” and watched as I drew nearer. In the winter, I take extra precautions to not cause the horses to change their behaviors with my actions. I kept my distance as I walked around the band. 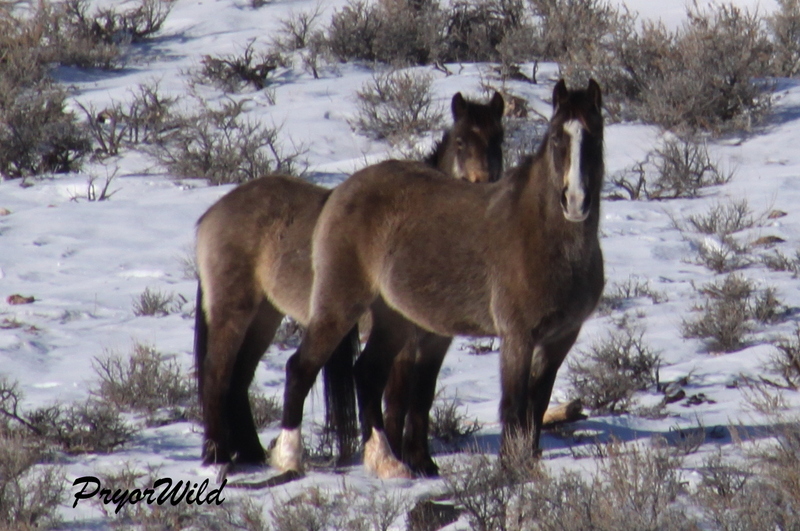 Orlando, the 2014 colt, was standing near his mother, Greta. She is very shy and kept an eye on me. Norma Jean was standing just beyond her mom and brother. Garcia was a short distance from her. 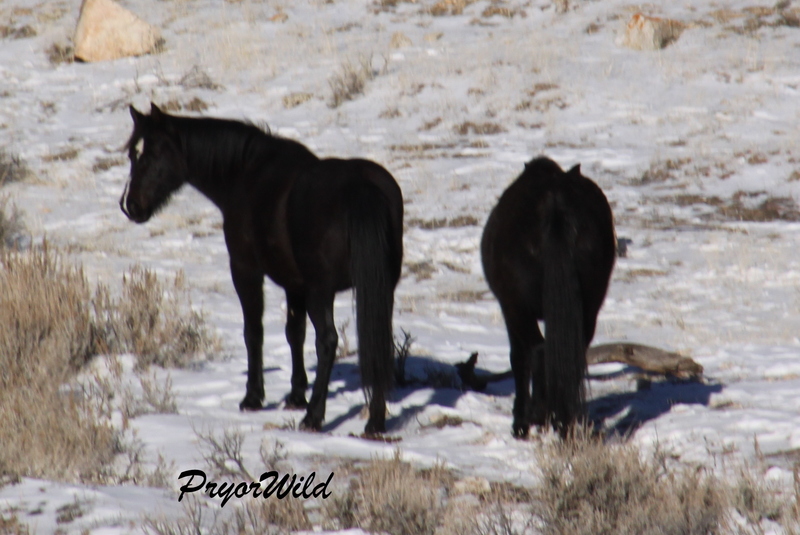 There was one missing, Millicent, the 2012 dun filly was not with the band today. She definitely is of the age when she could have left her birth band. This is one example of this winter’s changes. I left Garcia’s band and continued west towards the mouth of Big Coulee. 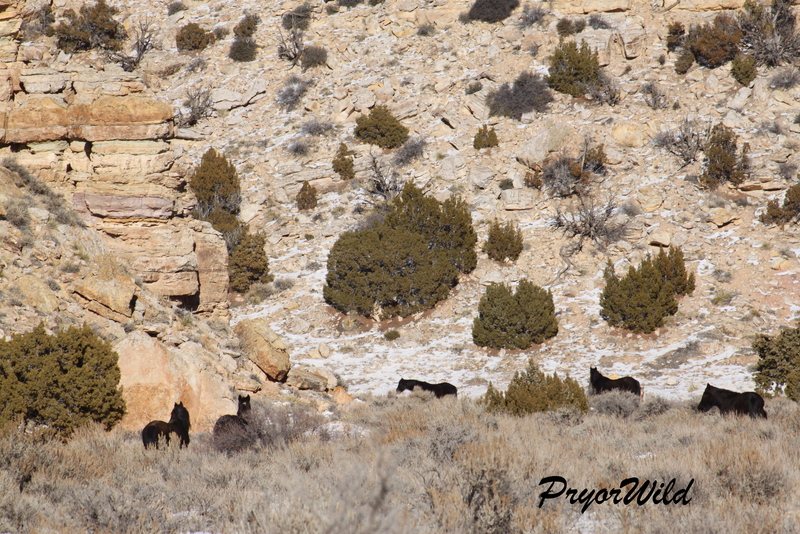 This area is well-protected and provides good forage in the winter. Sure enough, there were many horses in the area. The first band I saw revealed more change. Horizon’s band caught sight of me and showed great curiosity. Leading the way was Dove and her daughter, Manuelita, also known as Mourning Dove. Wait a minute…they don’t belong with this band. They had been with Coronado’s band even after it was taken by Irial. 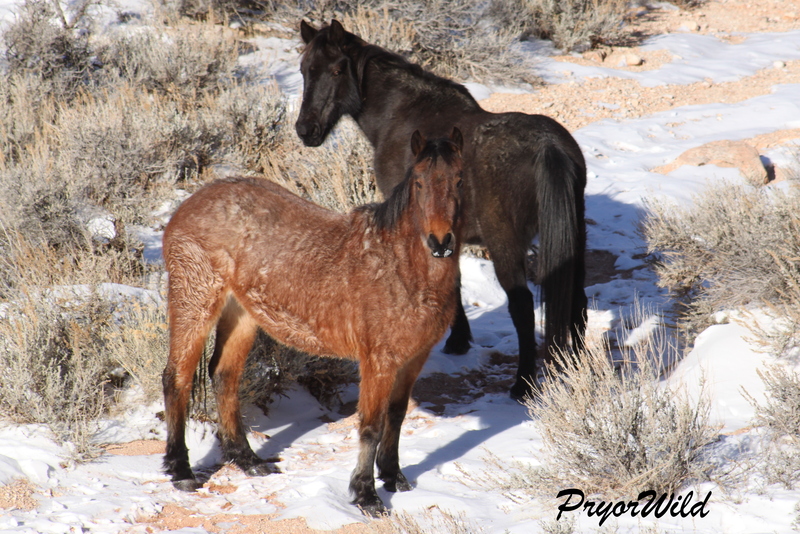 But there is no mistaking the dark buckskin color of this mother/daughter pair. The band drew nearer to me and are seen from left to right: Juniper, Tonapah, Dove, Manuelita, Horizon and the ever-faithful Fiesta. But wait…two are missing…Lariat and Oklahoma. I kept scoping the area, just hoping they may be hidden somewhere. But they were no where to be found with the band. 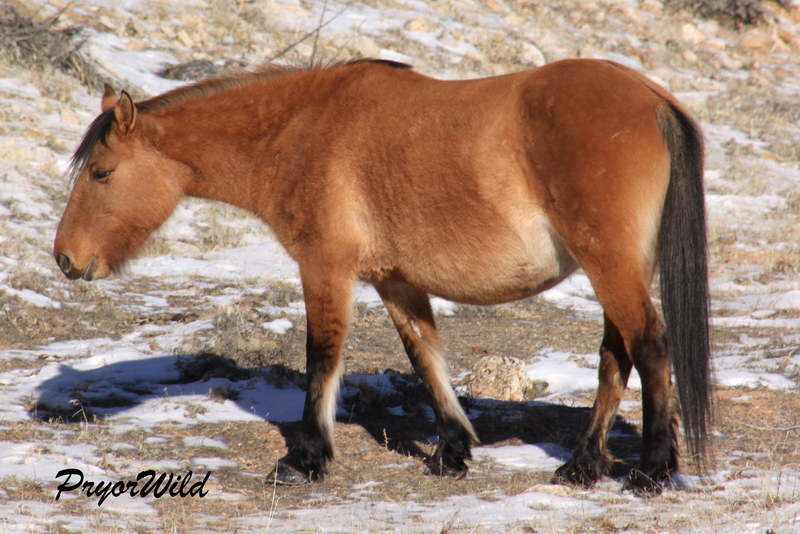 More horses could be seen north of Horizon’s Band up in Big Coulee. It was hard to identify the horses, so I moved closer. Even then it took awhile to realize this was Irial. 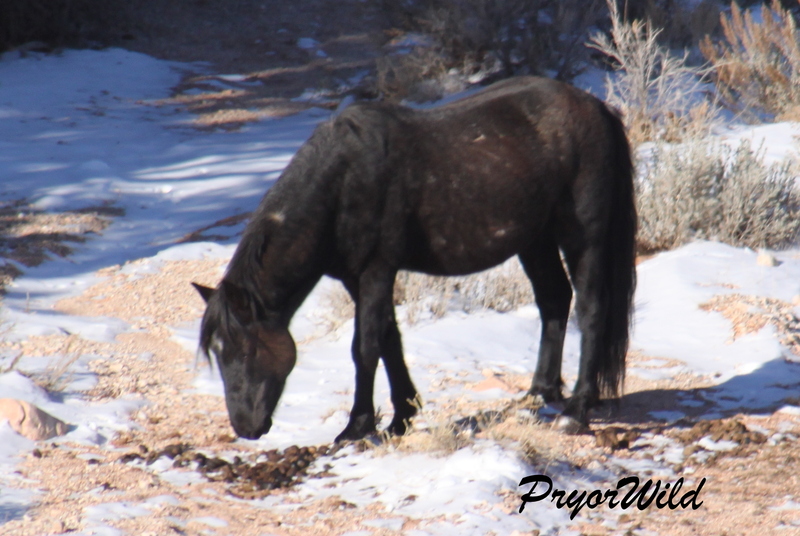 His blue roan coat had turned to a dark winter color. Other than Dove and Manuelita, his band was all there. Three more horses were just beyond Irial’s band. It was Bolder! 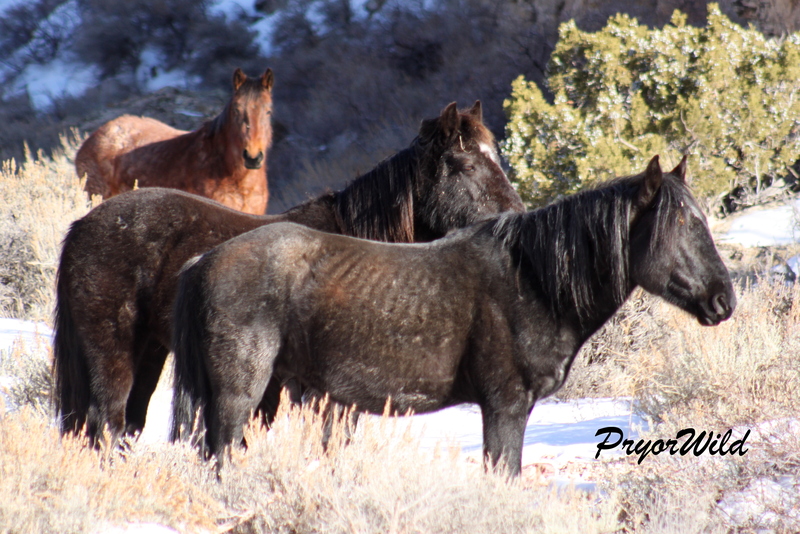 He was with two of his dark mares. I was still quite a distance from them and could only identify Celt because of her very distinct face marks. The horses were getting a bit restless and Bolder moved his mares deeper into the Coulee. I chose not to follow them any farther. Unfortunately I did not see if the rest of Bolder’s band was up ahead of Bolder and the mares. This will have to wait for another day. It was a good three and a half mile hike back to my vehicle and darkness comes early. It was time to head back.